Under the “Feed in Tariffs” the Government will GUARANTEE to pay you a premium amount for the electricity you generate – whether you use it or not! The feed-in tariff system is designed as an incentive for home owners and building managers to move away from conventional fossil fuels to renewable energy sources. In simple terms it is government legislation which guarantees a fixed, premium rate for renewable electricity generated – even if it is used in the building! 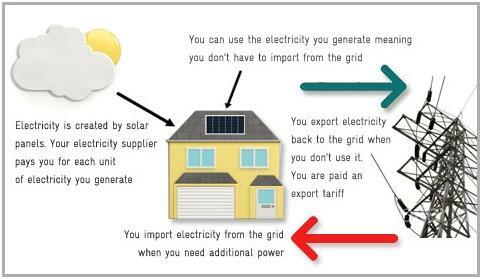 Under this tariff you do not have to sell the electricity produced by your solar power system in order to get paid for it – and you will be paid extra for any excess electricity that you do export. The UK government is committed to reducing its carbon emissions through the adoption of renewable energy sources, particularly in regards to the generation of power in order to combat climate change. Feed-in tariff legislation fixes an above market rate for utility companies to buy electricity from homeowners who produce renewable energy with a solar PV system. It is this fixed tariff which makes renewable energy an attractive prospect as it guarantees a return over a long period and has been highly successful where it has been implemented across Europe. Germany for example now produces over 14% of its energy from renewable sources, something which has been attributed to the generous and comprehensive feed-in tariff system implemented by the German government. Tariff levels vary depending on the scale of the installation and the date it is installed. The tariff levels shown in the OFGEM table apply to installations completed within the date range for the lifetime of those installations. After this date, the rates decrease each year for new entrants into the scheme. All generation tariff and export tariffs will be linked to the Retail Price Index (RPI) which ensures they rise with inflation. Please call 01562 977977 for more details or to find out what the latest FIT rates are.